Black pudding or blood pudding is a type of sausage made by cooking blood or dried blood with a filler until it is thick enough to congeal when cooled. 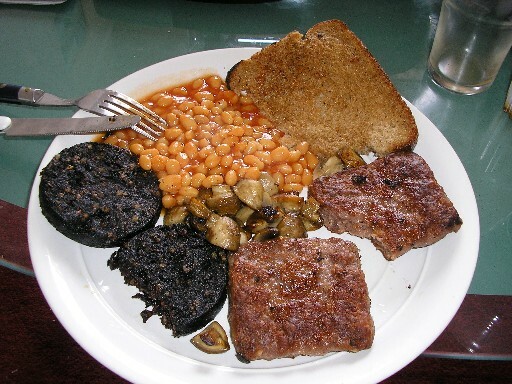 Left: Black pudding for breakfast, served with square sausage, baked beans, mushrooms, and fried bread. It is also called blood sausage (perhaps influenced by German Blutwurst). "Blood sausage" is also used as a term for similar blood-based solid foods around the world. Pig or cattle blood is most often used; sheep and goat blood are used to a lesser extent. Blood from poultry, horses and other animals is used more rarely. Typical fillers include meat, fat, suet, bread, sweet potato, barley and oatmeal. Black pudding is usually served as part of a traditional full breakfast in the United Kingdom and Ireland. Black pudding can be eaten uncooked but is often grilled or boiled in its skin.